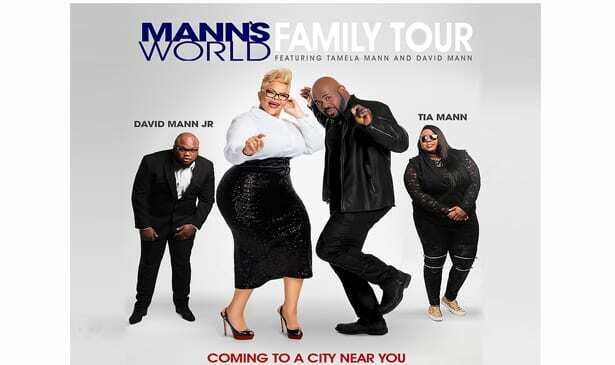 NASHVILLE, TN — Grammy® Award Winner Tamela Mann and NAACP Image Award-Winning Actor David Mann are bringing The Mann’s World Family Tour to the Mount Zion Baptist Church in Nashville on Saturday, November 18, 2017. The show also includes husband and wife Tamela and David’s talented Mann family: Tia Mann performing new music, DJ David Mann, Jr., a comedy set by David Mann, and a full concert by Gospel’s leading lady, Tamela Mann. Tamela recently received her first Grammy® Award for Best Gospel Performance Song for “God Provides” from her Billboard No. 1 album ‘One Way.’ Her 2017 Dove Award-winning song “Change Me” continues to hold the #1 slot on the Gospel Billboard chart for the 14th- straight week! She’s also been recently nominated for a Soul Train Award. From starring in the No. 1 TV and film franchise, Tyler Perry’s Meet The Browns together, to their current television hits, Tamela and David continue to make audiences laugh with their wholesome brand of comedy. The couple currently stars in ‘The Manns’ (TV One) and ‘Mann & Wife’ (Bounce TV). We’ve met ‘The Browns’ so now let’s meet the Manns away from the lights, glitz, and glamour. The Tribune spoke to David and Tamela last week during their recent visit to Nashville, shortly before boarding their flight. It was a chat filled with lots of laughs and some insight as to why the Manns are one of Hollywood’s most successful show business couples. This week it’s 5 Questions-plus because, with David and Tamela, the fun and laughter have no limits! TRIBUNE: What is The Mann Family Tour and all of that? David: It’s everything. We try to describe it as, it’s not just a party, not just a concert, it’s not just comedy, but it’s a full family experience. It’s something for the whole family. And so, we wanted to put together something where everybody could come out and enjoy it, whether you like to laugh, whether you like to party, whether you like to worship, whether you like to cry, laugh, anything. We wanted to make sure it was something that the entire family could enjoy. TRIBUNE: So how did the whole idea for the family too – because you’ve got your son and your daughter, so how did this all come about? Tamela: Well, the family’s together all the time, and our kids grew up around the stage. And so, they’re all talented in their own right, so I was just like, let’s just put it together where everybody’s out, and we’re all out together. We do the full tour, bring the kids – my son, he DJs, he starts the whole party off, like a big ‘family reunion’ we call it, and my daughter, Tia, the baby girl, she does like her own twist on some gospel favorites. So, she does it in like a neo-soul style way, and she does a few covers, and then I come out and do standup, and Tamela takes us home. TRIBUNE: You guys are definitely an entertainment power couple. What is the secret to staying together like this for so long? Tamela: We like each other, and we’re in love, and we enjoy each other’s company, and that’s the thing is, we just want to encourage other marriages and families, that’s why we really did the family tours, to encourage families to stay together, and to do things together, and get back to the basics. But we’re in love, you have to stay in love. TRIBUNE: What’s the most romantic gift Mr. David has ever gotten you so far? Tamela: Romantic gift? All of them. I’m not real picky. David: She’s not. She loves flowers. I can bring her some roses home, and it’s like I just got her a new car or something. Tamela: Yeah, I’m pretty simple. When I do ask for things, it’s a mighty big thing. David: Now, when she does ask for something, it’s not like, ‘I want some new shoes.’ It’s like, ‘You know, I think I want a new house. I think I want to get a new car.’ So, it’s like that. So, when she does ask – so I guess the most romantic thing is a new house. Tamela: Yes. But honestly, I’m just really grateful that whatever I kind of ask for, he kind of makes it happen. It’s really been a blessing. Tamela: I think the favorite one for me would be when he ate the muffin and he went back in the seventies, he thought he was really like a jock. David: A seventies soul brother. Tamela: Yes, he was so cool, but I think that was one of the ones when he had the glasses, and the afro, and big high-heeled cub shoes on. To me, that was one of the best ones for me. memorable ones. David: It’s a lot of them. Now that I think about it it’s like, wow, we did a hundred and forty episodes. TRIBUNE: You guys don’t have those outfits in storage anywhere at home? David: Not at home, but they’re in storage. Tamela: They’re at the studio. TRIBUNE: TRIBUNE: We are now in the holiday season and we’re coming into Thanksgiving, so who’s the cook at the Mann’s house? Tamela: Actually, both of us, just like you said. Because we both love to cook. David: I’m the griller. Put me on the grill, I do my cook. She can do it all, she’ll tell you. She can’t work the grill. Tamela: I’m the head chef! David: She can’t out-grill me. Tamela: That’s just because I didn’t want to master that one. I let him handle that. TRIBUNE: That’s what a good wife she is. David: She didn’t want to show me up. Is that what you’re saying? TRIBUNE: Well, I’m from Dallas also, so I know how grilling and guys are. You just don’t touch a guy’s grill. It’s like touching a guy’s radio. David: I have four grills. I have one for everything – grilling for steaks, grilling for this, and so there’s a grill for everything. Tamela: He likes it, so really, honestly, he is the griller, but we both do stuff inside. When it comes to the kitchen, we in there. David: Thank you for chatting with us Janice. Hey Nashville, make sure everybody comes out and see the show, Mount Zion, November 18th at Mount Zion Church, where our friend Bishop Walker is the pastor. We’ll be looking for you Nashville!